Can you believe that July is here already! The summer is just flying by isn't it? Today I thought I would share some of that beautiful lavender so many people are growing in their gardens. I started with some beautiful stamps from Power Poppy. I think everyone loves flowers & I wanted to combine these great stamps with some equally great dies. Here is what I came up with! 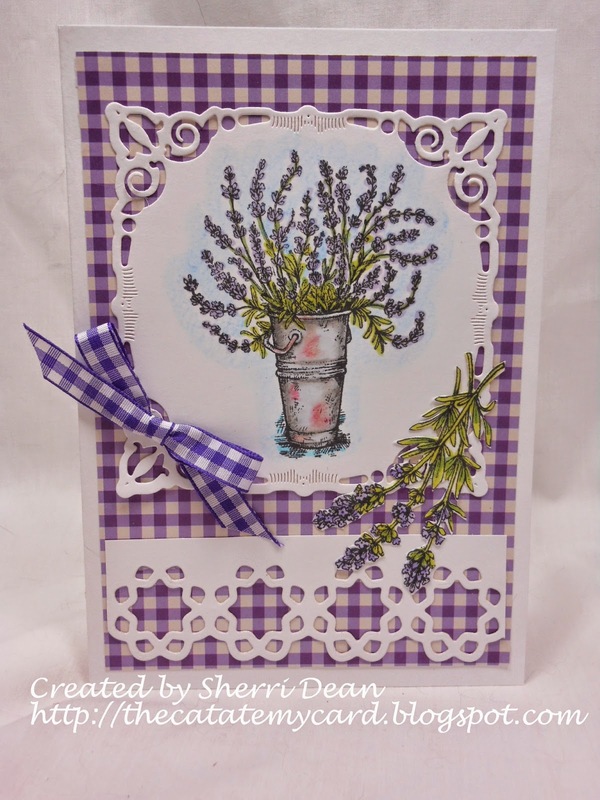 I chose Spellbinders Adorning Squares to frame the stamp and the beautiful border is made with a Spellbinders Lotus Borderabilities die. Isn't it amazing how you can take a simple image & create a beautiful card just by using the right dies? Be sure to head to the store to check them all out. I can't believe how many companies we carry now! And don't forget to check out the other talented ladies who are posting the rest of the week too! You will LOVE their creations! And for even more fun, head off to the Dies R Us weekly challenge for a chance to win! I'll see you back here next Wednesday with a surprise! Until then, have a great week & go create something wonderful!